If you’ve ever thought about brewing your own beer now is the time to start. 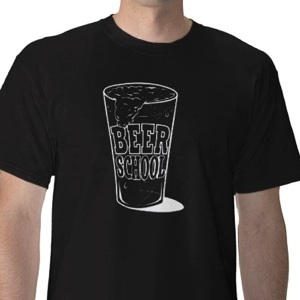 To entice you to get going Beer School worked out a deal with More Beer to get you $10 off a starter kit that is shipped for free! You have a choice of three kits: Good, Better and Even Better. All the kits come with instructions, sanitizer, caps, capper and hyrdometer. Good and Better kits assume that you have some parts like a 5 gallon kettle. Any kettle will do like one that you use to make pasta or fry a turkey. It’s also to you to collect or buy your own bottles. Which is fun because it’s an excuse to drink beer in non-screw top bottles. Caps and capper are included. You get to choose what beer you want to make (not included, sorry). Better and Even Better kits use a glass carboy for the fermenter. Although plastic is easier to carry glass will last longer and is easier to clean and sanitize. Clean is just the start with making beer. The vessels that you ferment beer in has to sterile otherwise you’ll have things growing in your beer that will make it bad. Plastic can more easily scratch and once scratched you cannot use it. That being said, from a starting out point of view, there’s nothing wrong with plastic. 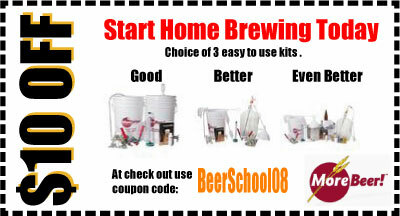 The Even Better kit comes with a kettle, bottles and a beer ingredient kit that brews Light Ale. You read that right, it comes with bottles. Impressive 22 ouncers! Note: $10 off offer subject to change without notice. 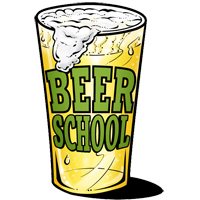 Beer School and More Beer is not responsible for spills, bottle bombs, infections, bad beer or the fun you have from making your own beer. Beer is good for you. Drink responsibly. YMMV.